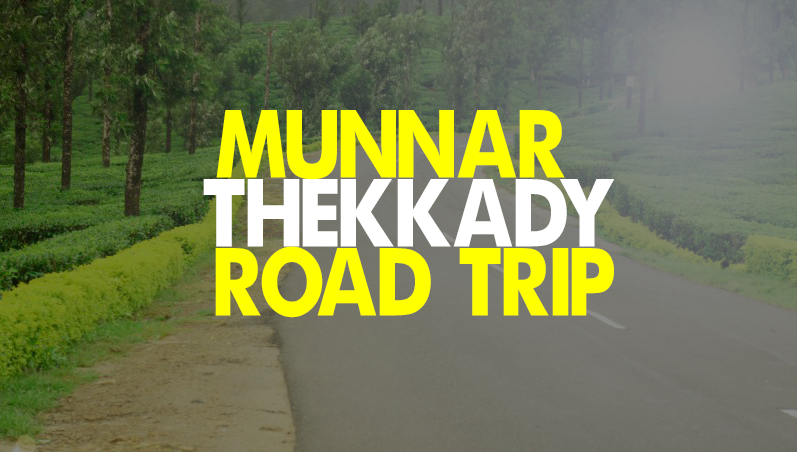 Are you looking for the best route, road conditions and places to see along the route from Munnar to Thekkady? Check out the driving directions and major attractions along the Munnar - Thekkady route. Munnar is undoubtedly the most visited tourist destination in Kerala. And Thekkady is not far behind. A good number of visitors to Munnar visit the Periyar Tiger Reserve at Thekkady. The entire route is of high terrains with mountains, hills, tea plantations and cardamom estates. The distance between Munnar and Thekkady is about 85 to 90 km, depending on the route you choose. Don't expect to drive at 80 km per hour and reach there in an hour. The roads are very narrow and broken in some places especially during monsoon. There will be a lot of trucks, buses and cars coming in the opposite direction and in many places, you may find it difficult to give way for other vehicles. The average speed you can maintain is 25 km per hour unless you are an experienced driver in hilly regions. Even for an experienced taxi driver, the average time to from Munnar to Thekkady is about 3 hours. The roads are very narrow in many places and so, even if you choose to drive fast, you may not be able to overtake another car in front of you! If you are driving yourself, drive slow and carefully. Give way for buses honking behind you only when it is safe to do so. Be extra careful during rain and when there is fog. If the visibility is poor due to fog, stop the car in a safe place and wait until the view is clear. Most beautiful and scenic route: The most scenic and beautiful route is Munnar - Devikulam - Pooppara - Udumbanchola - Thekkady. This route is about 100 km but the amazing scenic beauty along the route is worth the extra drive. Find the directions in Google map. Fastest route: The fastest route is, Munnar - Chithirapuram - Anachal - Rajakkad - Karithode - Nedumkandam - Thekkady. See the directions in Google Map. Shortest route: See the route map for the shortest route from Munnar to Thekkady. In the Munnar region, you will see a lot of beautiful hills, tea plantations, tea factories, cardamom estates etc with some small waterfalls here and there. As you move away from Munnar, the sight of tea estates will give way for jungles, forests and spice trails. You will see many resorts along the route and also many homestays in the small towns on the way. Most of the route are forest roads and you can enjoy the scenic beauty to its best. You will see streams and small waterfalls occasionally. Don't forget to stop at the view points and take a lot of pictures to carry the memories with you.